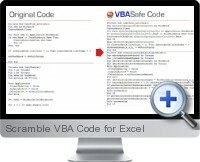 Scramble VBA Code for Excel is an advanced product specifically designed to protect VBA code and projects. Numerous applications are available on the internet which can be easily used to break the password security of VBA projects. Scramble VBA Code for Excel converts VBA code to a format which is unreadable to the human eye but still interpreted as normal code by Microsoft Excel. The Scramble VBA Code for Excel code scrambling mitigates the need for a VBA project password and overcomes the problem of weak VBA project security. Scramble the VBA Code - VBA code is converted in a matter of seconds no matter how complicated it is. This makes it extremely difficult for someone to understand and follow its logic. Clean the VBA Code - VBA projects are cleaned from any unused code that accumulates during the development phase which could lead to unspecified problems. This can result in a significant reduction in file size and improved execution time. Strip comments and blank lines - All blank lines and comments can be removed from the VBA code making it even more difficult to interpret.